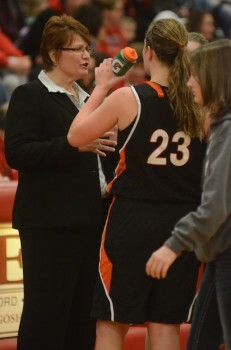 Warsaw girls basketball coach Michelle Harter will lead her team into regional play on Saturday at LaPorte. 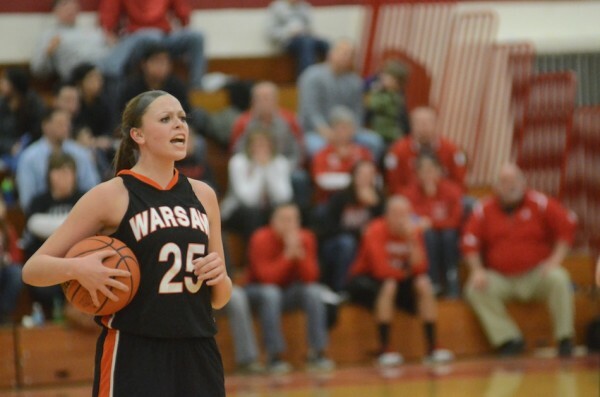 WARSAW – The Warsaw girls basketball team took care of business as the sectional favorites. Now the shoe sits on the other foot for the Tigers. Warsaw heads into regional play on Saturday, at least on paper, as the underdogs. The Tigers, 15-10 on the season, meet No. 9 Merrillville (19-7) at approximately 12:30 p.m. EST in the second semifinal game of the Class 4-A LaPorte Regional. No. 5 Penn (22-4) meets No. 7 Lake Central (21-3) at 10:30 a.m. in the regional opener. The semifinal winners return to LaPorte High School Saturday night to meet in the regional title game at 8:30 p.m. EST. The regional champion earns a berth in the one-game semi state on Feb. 28 to be held at either Warsaw or Crown Point. “We know we are the underdogs, but our girls thrive on that,” said Warsaw coach Michelle Harter. “They want to prove themselves. Warsaw beat Merrillvile 42-41 in the regional title game at Valparaiso back in 2013. The teams have not met this season. Merrillvile, which beat Valparaiso 65-37 Monday night in the sectional finale at Michigan City, is in the regional for the third straight year. The Pirates have won 12 straight games since starting the season at 7-7. “We need to not allow them to get easy dribble penetration and we have to keep them off the boards,” said Harter of the long and athletic Pirates. “We have to take care of the ball. That will be very key for us Saturday. Senior Pam Miller will play a key role for the Tigers in the regional. Warsaw beat Goshen 39-33 Monday night to win the Goshen Sectional. Erin Clemens, one of four seniors, led the Tigers with 12 points and eight rebounds. Sophomore Dayton Groninger, the top scorer for the Tigers, had eight points, senior Jodie Carlson seven and senior Pam Miller six and nine rebounds in the sectional title game. The Pirates are led by senior Victoria Gaines. The 6-1 forward, who has signed with Michigan State, can do it all. She is averaging 11 points, five rebounds and four assists per game. Gaines returned to action in December after suffering her second torn ACL in her knee back in July. She also tore her ACL in a sectional semifinal game her freshman year. Gaines averaged 15.8 points her freshman year and 13.2 as a sophomore. Gaines, who also considered Purdue and Ball State before committing to MSU, had just four points in the sectional title game win over Valparaiso. The trio of Jaz Talley, joshlynn King and Ashiala Jackson each scored 12 points to lead the Pirates. Merrillville did beat Penn 48-46 back on Jan. 3 at Marrillville. The Pirates also have wins over Elkhart Memorial (51-31) and Northridge (50-40), two NLC teams that Warsaw has also defeated this season. Merrillville lost to Lake Central 55-41 on Dec. 5 at home. Warsaw did not play Lake Central, which has won its last nine games, this season. The Tigers did lost 47-26 at Penn on Jan. 21. Penn, which was state runner-up last year, is making its fifth straight regional appearance. The Kingsmen have won nine in a row, but did lose 49-48 to Lake Central at home way back on Nov. 22. Lake Central is the highest scoring team in the regional at 65 ppg. Penn averages 59, Merrillville 55 and Warsaw 42. The Kingsmen have the top scoring defense as they allow just 36 ppg. Warsaw gives up just 39 ppg., while Lake Central allows 43 and Merrillville 46. Warsaw was not able to travel to LaPorte on Wednesday night for its allotted practice time there due to the weather. Harter believes her team is ready to go. Sophomore guard Madi Graham will direct the Tiger attack on Saturday.